‘Tis the season Cape St. Claire! Just like every year, our community becomes transformed around the holidays. Seasonal decorations are going up everywhere. You are pulling out the holiday decorations from storage. They raise our holiday spirits, making our community feel cozy and festive. Not only do they help create lasting holiday traditions, family decorating can create amazing memories for everyone. If you are looking to get a start on your holiday decorating or add to what you already have, look no further than your local Cape hardware store. Our holiday decorations at Cape Ace will help you to capture the feeling of a Winter Wonderland that is sure to leave you ‘merry and oh so bright’. From small to little, and everything in between, grab your artificial Christmas tree. This year, you can skip the tree mess, difficult setup, and maintenance. You can also choose from pre-lit, multi-color, clear, and more! If you already have your Christmas tree picked out, try our new Tree Dazzler LED Light Show! You can avoid the untangling of several feet of tree lights and with the press of a button, you can feast your eyes. It has 64 animated globe lights and 16 colors and patterns to light your tree. Cape Ace also carry’s the basics, from tree stands like the Dyno Swivel Straight Tree Stand. Since no tree is ever perfect, this stand lets you tilt it slightly until it looks straight. Further, the stand is made of thick polymer to secure your tree at a maximum height of 10 feet. Also, come in to see other ornaments and holiday decorations at Cape Ace you can use to decorate your tree. Occasions Row of Presents Christmas Inflatable 8 ft. 5 pc. 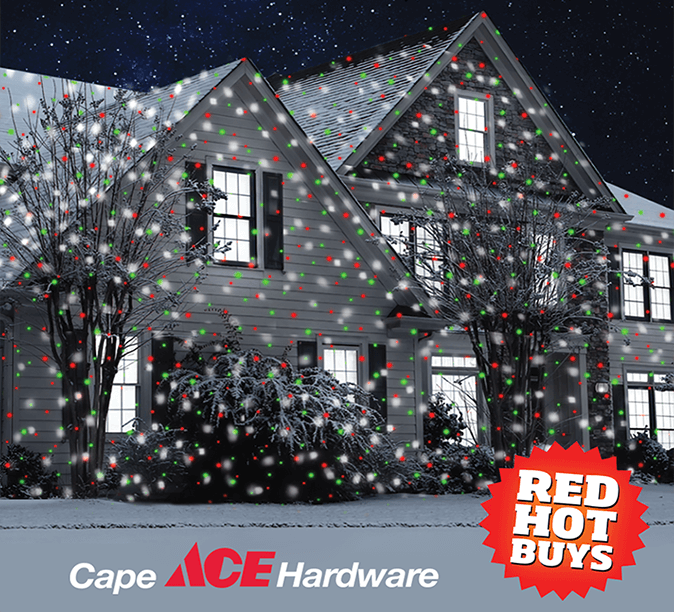 Save time and drop by to pick up all of your holiday decorations at Cape Ace. Also, if you see something online that interests you, come into the store and we can order it for you. Don’t forget to take advantage of our Red Hot Buys for all of your gifts this season. From November 1st – December 24th, you can save on light projectors, light reels, wreaths, and more.